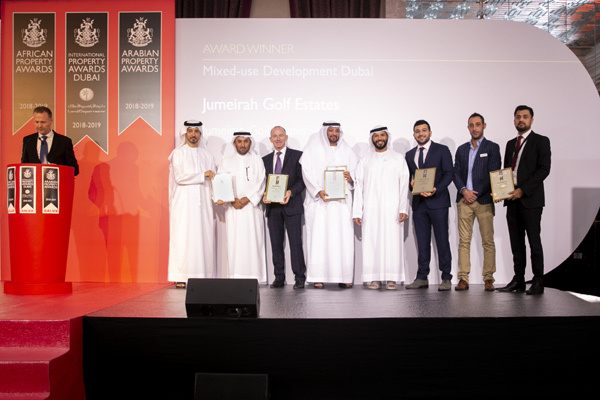 Jumeirah Golf Estates (JGE), a world-class residential golf destination offering luxury homes and leisure facilities among two internationally-acclaimed championship golf courses in Dubai, has won seven awards at International Property Awards Dubai. At a ceremony held recently, JGE received the awards for Architecture Multiple residence – Alandalus, Development Marketing, mixed-use development, residential high-rise development, and three five stars awards for Best Residential Development, Best Leisure Development, and Best Developer website. The five star awards, nominated as Arabia’s best, will be presented at the International Property Awards taking place this year in London together with other international winners. Each of the categories welcomed hundreds of entries, including some of Dubai’s most renowned projects, and these awards are a testament to JGE’s unique products and ability to monitor and adapt to the needs of the market, said the statement.